Have you ever noticed that our gardens are an expression of the need to bring beautiful life to our houses? The problem is that weeds can spoil this magic. They give this unruly and wild look to the garden. This is why you need to get hold of the best weed barrier. You can read more details about product reviews below, or click the links above to see these products on Amazon.com. What Are the Key Perks of Weed Barriers? What Are the Different Types of Weed Barriers? How to Select the Best Weed Barrier? It is quite understandable that you will want to know the perks of investing in a weed barrier. When you get hold of a weed barrier, then you will not witness any weed growth in the beginning. The soil will not dry out quickly, and the moisture will remain preserved in the ground when you use a weed barrier. What is worth appreciating is that when you start to use a weed barrier, then the soil warms up quite quickly. When you are about to invest in a weed barrier, then you need to be aware of the different varieties available. This way you can evaluate your needs and make your choice accordingly. Some gardeners use the natural barriers. They place natural materials next to their plants to block the weeds. For example, a thick layer of leaves, peat moss and mulch can be quite useful for blocking the weeds. Natural materials are biodegradable, and this is why they do require yearly replenishing. The natural barriers like straw and mulch have weed seeds. This can make the weed problem worse. This is why the best approach is to use the natural barriers as temporary barriers. You can opt for fabric barriers also when you want to block the weeds. They are made from synthetic geotextile material. The fabric barriers have a lamination that is made up of black polyethene material. This lamination is more of a thin layer. The black color lamination darkens the soil and easily blocks the sunlight. The weeds get starved because they are unable to get the sunlight required for their growth. The plastic barriers spread over the weeds can block the sunlight completely. This is why the weeds do not get their supply of oxygen, water or sunlight. The black color of the plastic barrier can easily absorb the sunlight, and this helps to warm up the soil. This eventually helps to promote the root growth of the surrounding plants. The interesting part is that you can opt for the homemade barriers also to prevent the growth of weeds. For example, you can make use of plastic garbage bags and newspapers. You will find many tutorials online to create homemade barriers. These tutorials will help you understand the concept of weed blockers. The problem with these materials is that they decompose into the soil after some time. The homemade barriers block the weeds, but they look messy and disorganized. Another problem is that strong winds may blow away the newspapers. To get more details about homemade barriers watch this video. When you are choosing you weed barrier, then the first thing that you need to analyze is your need. For example, analyze your requirements. A long-term garden project has a different set of requirements. For example, you can also opt for temporary weed blockers for short-term projects. However, this rule will not work for long-term projects. The plastic weed barrier will turn out to be the best selection for a long-term garden project. When you use a plastic barrier, then it plays a vital role to reduce the soil moisture evaporation. The plastic barriers do not develop tears easily, and this is why they can last for a long time to come. The plastic barriers are expensive, but this investment is worth it. The plastic barriers can block the weeds from shrub borders or the flower beds. The fabric barriers are also effective in blocking the weeds, but they are not durable. After some years the textile material may become soft and develop tears. 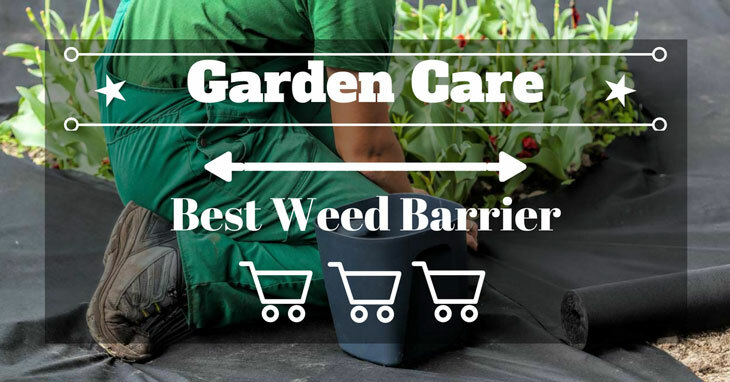 When you are buying a weed barrier, then it should give a clean look to the garden. For example, you should go for landscape fabric that should gel in well with your garden and look pretty. Plastic weed barriers are quite effective, but they may not be environment-friendly. You can opt for a fabric weed barrier in this situation. Before going for a fabric barrier, do check out the materials used to create the fabric. The materials should not pose a threat to the environment. What makes Dewitt SBLT4300 unique is that it has a Sunbelt ground cover. It is permeable to water and air. It has UV stabilized also. It is a great selection of outdoor and greenhouse use. This weed blocker has a length of about 300 feet and, the width of this weed blocker is about 4 feet. It has a superior quality woven black polypropylene material. This weed barrier is quite resistant to puncturing, and it can easily resist tearing also. The water penetration of this weed blocker can be improved. DeWitt Pro 5 has a measurement of 5 feet by 250 feet. When you make use of this weed fabric, then it reduces the need to use any herbicides. This fabric is 100% opaque. It prevents the seed germination and the process of photosynthesis also. Pro5 is made up of 5 ounces of the needle punched material. This contributes to the durability and the strength of this fabric. It can easily conserve the moisture and surely prevents the weeds from sprouting. This is why you can easily acquire a professionally landscaped look in your garden. This fabric can also be termed as environmentally safe, and it works well for commercial use also. This weed barrier is stripped, and it helps to support the alignment of the plants. This fabric barrier will improve the plant growth. It offers the superior light blocking feature. It allows the nutrients, water and, air to pass through the fabric with immense ease. When you buy this weed fabric, then you get a guarantee of five years against UV deterioration. What you will love about Pro5 is that it is quite easy to install. This weed barrier is a bit expensive. Agfabric is an environment-friendly weed barrier. It prevents the weeds from germinating. The best part is that you do not need to make use of any harsh chemicals also. This helps to preserve the health of the soil as well. I was also apprehensive about using Agfabric weed barrier. I made a serious mistake and used chemicals to stop the weed growth. I feel that it was a big mistake on my part. The reason is that it destroyed the plant growth. The plants looked dried up and lifeless due to the use of the herbicides. When I tried Agfabric mat, I found it to be durable. The results were satisfactory, and I was able to control the growth of the weeds. This mat has a side that is not woven, and it stays on the ground with ease. It can easily conserve the water also. This eventually helps to promote the growth of the plants. This fabric is UV stabilized. This is why it can easily stay in the sunlight for even five years. Maintaining this mat is also not a hard job. You just have to clean the fabric with water, and it is good to use again. You will notice that this mat has got needles punched in the back. This is why it does not quite slip off in the sunlight. I find this feature to be quite useful because I have been struggling with weed blockers that fail to stay on. It can be a hassle to put the fabric on the plants time and time again. This weed blocker is quite cost-friendly. It is quite easy to use, and even a novice gardener can try it out. The manufacturer recommends that the mat should be covered with mulch. This should not be the need if the product is durable. If you are looking for a good quality weed blocker, then you can opt for Landmaster weed barrier also. The biggest quality about this fabric barrier is that it can keep the soil moist for a long time. It has plenty of nutrients also, and this is why it can control the growth of the weeds without a problem. It is UV protected. This is why this fabric barrier can easily last for a long time to come. The key material that is used in the manufacture of this barrier is Bonded Polypropylene. This weed barrier works well for commercial and residential projects. The manufacturer needs to improve the packing of this barrier. Installation of Ecogardener Weed Blocker is simple. It is heavy enough to give adequate protection to your garden. A light fabric will not be able to cover your garden properly. As a result, it will become a problem to stop the growth of the weeds. My friend bought a light weed blocker sometime back. It allowed the sunlight to seep through and she had to deal with messy weeds. When you opt for Ecogardener Weed Blocker, then it only allows water and air to seep through. This is why it is not quite a problem to conserve the moisture in the soil. To acquire the maximum benefit from this weed blocker, you should make it a point to put the staples through it. Ideally, you should make use of at least six staples. The benefit of this practice is that the wind will not be able to blow away this weed blocker. The Ecogardener fabric has a sturdy design and is designed to last for a long time to come. It is an eco-friendly alternative. You get a 30-day money back guarantee with this weed barrier. The underside of the fabric is not thick enough. We have given you all the necessary details about weed barriers. Do read the section that discusses the different weed blockers available. To facilitate you we have also listed the best weed barriers available. When you have to make your pick, we suggest that you should explore all the mentioned options. Carefully evaluate the features of each of the weed blockers. This way you will be able to make a clear decision about which weed barrier best suits your needs. Consider DeWitt as your first preference because it is a reputed brand. There are different models offered by Dewitt. We have discussed two of them. Every model is better than the other because you get improved features with every model. Dewitt has the edge over other weed barriers when it comes to the quality. These Dewitt model do live up to the requirements of the users. It is also important that you should devise a clear strategy before making your purchase. You should prepare your list of queries and put up the questions to the manufacturer. This way you will be able to select the best weed blocker. The responses of the customer support will have a clear idea about the credibility of the brand also. A good brand always tries to address the queries of the customers on a priority basis. When you buy a weed barrier, follow the usage instructions on the packing. If you follow the suggested approach, your garden will be free of weeds in no time.